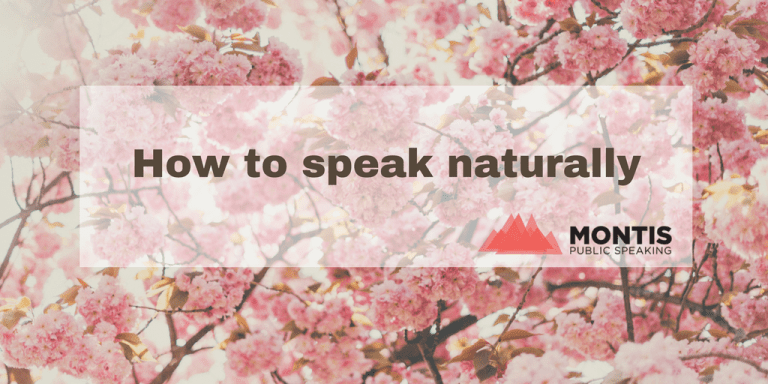 ‘How can I make sure I speak naturally?’ clients often ask me. ‘What does it mean to you to speak naturally?’ I reply. Answers go from ‘not speaking to fast’, to ‘I don’t know why but I speak with another voice when I am in front of an audience’, to ‘speak fluently without losing my flow’ or ‘to show confidence’. Intuitively we feel that we must speak naturally, but we don’t know why. The answer is really simple: because we want to connect. Without connection there is no impact. And that, dear ladies and gentleman, is exactly what we are looking for when we speak: impact! Whether we speak to inform, persuade or entertain. But how can we make sure we speak naturally for impact? The answer is not the same for everyone. Let me tell you about one client who was very professional, had a curious mind and was introverted. Let’s give her the name Silvia. She was going to speak at a business event with potential clients bringing a client case on stage. When Silvia spoke in front of an audience she made herself smaller, her voice was very low and she was shying away from eye contact. The solution was not in me telling Silvia ‘make yourself taller, speak up and make intentional eye contact.’ What I did was enquiring further on how do you feel about speaking in front of an audience. ‘I hate it when all eyes are on me’ she said. I perform best in supporting rather than leading roles. She came from ‘I want to escape’, ‘nobody will listen to me’ and ‘I hold back’. By shifting the attention away from herself to offering value for the audience, her perspective on public speaking changed. And she was able to have more stage presence, speak up and connect with her audience. PS: Do you have a question on public speaking you would like to see answered? Shoot your question in the comments section.